Home General New Year, New webpage and 170.000 visits! 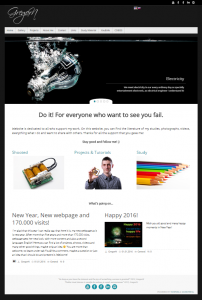 I'm glad that this year I can really say, that here it is, my new webpage as it is new year. After more than five years and more than 170.000 visits, webpage gets her new look, with more content and also a second language, English! Here you can find a lot of projects, photos, videos and many other good things, maybe only an idea 🙂 You are more than welcome, to leave under tab You&Me a comment, maybe a question or just an idea that I should do and present it. Welcome!